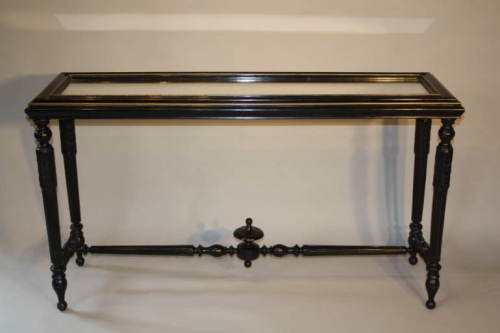 A very elegant, ebonised and brass banded console/sofa table with mercury glass inset top, French c1890. The design of this console is attributed to Maison Jansen and is beautifully made with elegant fluted legs featuring stylised acanthus leaves and urn detail to the stretcher. The faded brass banded top is inset with very sparkly mercury mirror glass. Slight loss to corners as shown in the picture and minor scratches to the glass are consistent with age and use. A wonderful and exceptional finished piece that would work both as a console as well as a sofa table.